Bangalore has been bustling with new eateries every week. After creating a strong buzz in Delhi, Dubai, and Mumbai, the Modern Indian Bistro is finally in Namma Bengaluru. Well, I am talking about Farzi Café in UB City. Farzi Café is located in the level 2 floor of India’s first Luxury Mall – UB City. The restaurant derives its name from the Urdu word Farzi, illusion or fantasy being one of the meanings of this word. The Farzi Café cuisine is unique, where molecular-gastronomy-meets-modern Indian cuisine. When the invite for their launch party came in, I expected it was just a sheet of paper until I read ‘Disclaimer: This is an edible invite.’ Yes, you read that right! It was made with White Chocolate and could only be destroyed by eating. That’s something beyond the imagination, isn’t it? I was too excited and eagerly waiting for the launch party. I also witnessed the Pre-Launch party though! The Pre-Launch and Launch parties were outstanding and these went on for a week. This was one of the best ever parties, I have visited so far! They served some of the Farzi Café’s signature cocktails like Farzi Idea, 3 Musketeers, Bunta, Mango Chutney, Apple Fermentini, Shikanjvi, Bottle ka Gin and Hard Liquor. They served Finger foods like Chilli fried idly with beet root and ginger rasam, Gupta Burger, Tandoori Margarita Kulcha, Paddu Yaki and desserts like Parle-G Cheese Cake, Rasmalai Tres Leches. The ambiance of the Farzi Café is trendy with large outdoor space and discreet fashionable indoors with earthy shades, chandeliers and lamp shades. Comfy couches are placed in the middle of the outdoor and high tables near the Bar counter as well as near Entrance. I couldn’t stay longer due to some unexpected work and had to leave early. However, the Farzi Café team was kind enough and invited me exclusively post launch. The invite was extended to a couple of my other foodie friends also. It’s not so easy to get a table especially on weekends. However, there are young and energetic folks like Neeraj, Avinash Kapoli, Ashok Sam and Ammy Dua not only helped me in reserving the table also extended their service throughout my visit. These folks are great asset to Farzi Café Bengaluru. Mishti-doi Amuse bouche – This was served as soon as we witnessed the Molecular Gastronomy. Well, this was refreshing and indeed great. Dal Chawal Arancini – Arancini is a typical Italian rice balls. In Farzi, they have amalgamated the Indian Dal Kichdi in Arancini placed on spicy tomato & onion salsa. They garnished the balls with rolled papad. Mini Raj Kachori – The dish topped with chutney foam and served with crispy okra salad. This tastes indeed great after a nice blending. Besant Nagar Fried chilies with tamarind and Chili salsa – The batter fried chilies stuffed with creamy cheese and topped with spicy gun powder and garnished with micro greens, which is served with Tamarind & Chili Salsa. This was inimitably served in a cane basket with a banana leaf. Paddu Yaki – Farzi café has taken this most popular south Indian dish to the next level by adding crispy pine nuts, gun powder and tomato chutney. The Paddus were soft, fluffy and flavorful. I couldn’t go for the main course, because the above appetizers were quite filling! However, I kept some space for desserts like Parle G Cheese Cake and Rasmalai Tres Leches. Parle G Cheese cake was good. But not enjoyed much. Since, I felt the cheese cake sandwiched in Parle G biscuit was higher on sweet. However, the Rabri was excellent. I felt nostalgic when I saw Cadbury Gems on the Cheese Cake. Rasmalai Tres Leches was one of the showstopper on that evening! I enjoyed every bite of it and must try dessert at Farzi Café. When the Farzi Café launched in Bangalore, the first 15 days restaurant was not opened for lunch. That was quite disappointing for a Food Photographer like me! Since, the above pictures was captured during my first 2 visits did not do the justice because of the low light. As soon as they introduced lunch, my partners in crime ganged up and visited. This was my 3rd visit. It wasn’t so easy to get a table and the restaurant folks stopped taking reservations due to more walk-ins than expected. Somehow, we managed to get one table for us! The restaurant was completely packed around 1pm on a weekday afternoon. However, there was no compromise on taking orders and quick service. The guys were energetic, patient and enthusiastic to suggest & take orders. 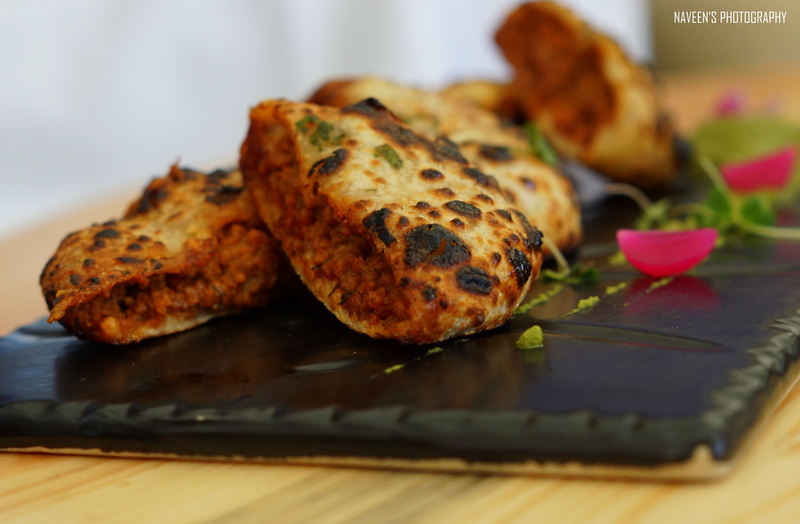 Kheema Kulcha – A Mutton Kheema stuffed in Kulcha’s. Being a vegetarian I could see the happy faces who savored this beauty. Margarita Kulcha – The Kulchas were outstanding and tasted incredibly great. The Kulchas stuffed with spicy cheese and was served in Dim Sum basket. Reverse Vada Pav – Being a Vada Pav lover, I will never say no to it. Trust me, the one at Farzi will definitely beat the other ones. This is something like “Baap of all the Vada Pavs”. The pav is inside the vada at Farzi. I have been noticing the over powering of mint in green chutney at most of the places. However, I could sense the spice level of the green chutney along with the fried green chili. The portion is quite filling and matches to the main course. Upma Crockets with Puli Ingi – I love Upma only when it is hot! The Farzi did a wonder by making the same dish in to croquets and served uniquely. The dish is crispy outside and soft inside. The dish goes perfectly with the Tamarind based Puli Ingi Dip. Panner Tikka – I wasn’t impressed about it. Since, there is no much difference compare to other places. However, the Paneer was soft and marinated perfectly with good texture. Ratatouille Bhaji with Maska Pav – The dish is an amalgamation of French Ratatouille and Mumbai Bhaji. The dish gives both the flavors in one bite. This was brilliantly made by the Farzi Team. Rajasthani Kadi & Ghee Pulao – The Ghee Pulao could have been better. It tasted more like Jeera Rice with very less flavor. However, I liked the Kadi since it wasn’t too bitter. Tandoori Gucchi Risotto – If you are looking for an authentic Italian Risotto, farzi is not your place and I don’t recommend at all. The Risotto at Farzi is the Indianised version, which is again well made without compromising the quality and good texture. The dish is quite filling! Masala Poha with Baked Egg Curry – Though I don’t eat egg, I was tempted to do so. I just tried a bite and loved it. The Masala Poha was upright. Baileys Lolly Pop – It was another innovation from Farzi folks, these were outstanding. One must definitely experience it. I would like to Thank Mr. Zorawar Kalra and Rekha Gosh for having us at Farzi Café, It was an incredible and matchless experience till date. They are soon coming up with Micro Brewery and i am excited and eager to try those. Farzi is the place for experience along with great food. I am sure its going to be a Memorable one for others as well. I will definitely recommend this place to everyone! Cost for 2: 1500 INR Approx.